3 April 2012 in CyberRights, General, News, Personal, Philosophy, Privacy, Rants, Society and politics, Why not? Utopia? Atlanta’s Hartsfield airport has been having one of those useless scanners that show passengers naked for a while now. But the last time I was there, they were being tested, and most passengers did not go through them. 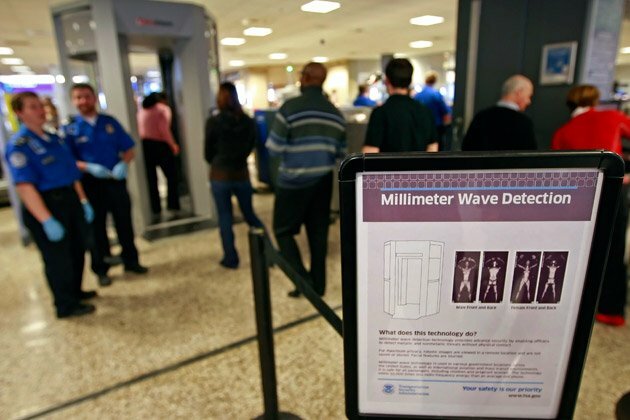 Today, though, as I approached the security line, I saw that next to every metal detector, there was one of those scanners. “Wow, this is getting worse”, I thought, while seeing how almost everybody was going through the scanners. – Sir, you need to go through here. – No, I don’t. –I replied– I prefer to go through the metal detector. – Everybody has to go through here – she replied while a very large woman, a child, and an old man were being told by another (male) TSA agent to go through the metal detector. – Obviously that is not true – I reply, looking at the line being formed in front of the metal detector. 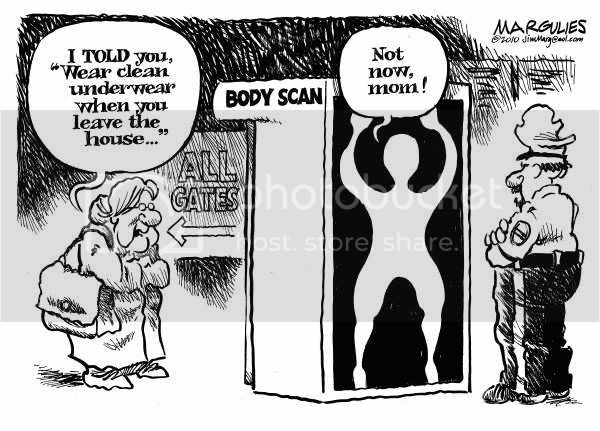 – I have medical, political, and personal objections to the use of those scanners, particularly on me. – This sign shows there is no need for concern, sir – she stubbornly tells me, turning a sign that was not readily visible by passengers towards me. The misleading sign basically said (too bad she would not let me take a picture) something along the lines that the scanner was safe, and it software allowed TSA agents to guarantee our safety. No mention of political, privacy, misuse, or medical concerns. – Still, I refuse to go through the scanner, and since the metal detector is right here, and working, I prefer to go through the metal detector like those people. – You then will have to be patted down by a male TSA agent. Is that OK? –She says. – I don’t see those people who have gone through the metal detector before me being patted down. – Sir, those are the regulations: if you opt-out you need to go through the metal detector and you need to be patted down. I decided there was no use in arguing with her regarding the correct use and meaning of the word “need”. I also decided that the accuracy of her claims could be checked later, because going through the trouble of doing it on the spot could make me loose my flight, so I agreed, and went through the metal detector. – Sir, you need to stand here –right next to him and the detector; there goes the “need” again. I obediently stand where he points. – “Male opt-out on line 14-15!” –he calls for through his intercom. I move about 3 inches to check my carryon luggage, shoes, laptop, phone, watch and wallet, waiting for me at the end of the object x-ray scanner, to make sure nobody takes anything “by mistake” (since the people that are “taking care of our security” do not seem to care about our property). – Sir, I asked you to stand right here –he reminds me, pointing to what seem to be directly my feet. I don’t know if my look conveyed the “WTF” correctly. I wish I could have typed it on my phone’s LED screen app. Some 30 minutes later (one thing one learns after decades of air travel and security checkpoints is that there is no point in worrying about missing the flight once you are “on your way”) a female TSA agent comes and says “you pat him down, I got the line”. So the male TSA agent, very professionally explains to me the whole procedure (his explaining took about double the time the procedure itself), and asks me several times if I understand and if I am OK with that, adding that we can go to a private screening room if I feel uncomfortable going through that in public. I do feel uncomfortable in public, pat down or not, so the private screening room does not offer me any relief. Then my luggage gets “screened” and a particle sample taken from my clothes is run through the explosives detector. All that because I dared to choose? to exercise my rights? to speak up and stand up for what I believe? I don’t care how difficult fascism (yes, I understand the severity of the word, know its history, and chose it accordingly) makes my life. I will fight, take it, or flee. But I am NOT jumping through their loop. And I will not keep quiet. To top it off, I have missed the CUNY Graduate Center talk “The Brain” by Richard Axel and Lawrence F. Abbott.